So I told you about the joys of yeast the other day. But I didn't actually share a recipe for any breads that use yeast. That is not fair at all. How could I do that to you? Well, I'm going to make it up to you today. I am going to give you a recipe that might just change your life. Ok, ok. It probably can't do that. It will, however, brighten your day. I realize that this is an awfully ambitious recipe for me to share with you as our first yeast bread, but it is so worth it. My dad, king of the bagels, declared these to be the best bagels he's ever had. It is so difficult to get a good bagel in Charleston. So many of them are dense and bready and entirely flavorless. In fact, I haven't had any really delicious bagels outside of New York. I actually read an article about a man who hypothesized that it is New York's water that makes all the difference. He recreated the pH and the mineral composition of New York's water and ended up with a very tasty bagel that rivaled those in the big apple. While this isn't exactly the kind you'd find in a deli or at a street cart in the city, it is awfully yummy. Each one is a bit different in shape, but it is endearing actually. 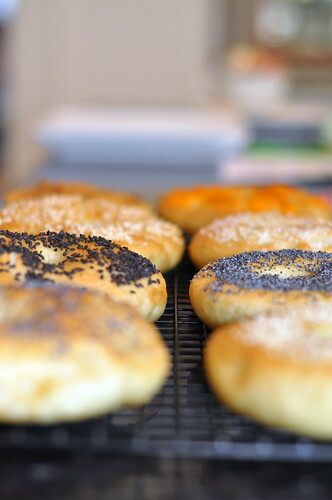 I had a great time playing around with the flavors of the bagels, experimenting with toppings. Some got a sprinkle of cheddar cheese. A few got black sesame seeds, while others received a handful of white sesame seeds. My sweet tooth got the best of me, resulting in a couple with a brown sugar topping. And to please the traditionalists in my house, I made some with sea salt and some with poppy seeds. They are the perfect blank canvas. Mix the yeast, a pinch of the sugar, and 1/2 cup of the water together in a small bowl. Let stand for 5 minutes until it is foamy. Whisk 2 cups of the flour, the remaining sugar, and the salt together in the bowl of a stand mixer. Add the remaining 1 1/2 cups of the water and the canola oil and beat to combine. Add the yeast mixture and another cup of the flour, beating for one minute until the mixture is creamy and smooth. 1/2 cup at a time, add the remaining 2 1/2 cups of flour. Beat until the dough is cohesive and forms a ball. Replace the paddle attachment with the dough hook and knead for 6 minutes. Transfer to a well-oiled bowl, cover with plastic wrap, and let rise until doubled in bulk, about an hour. Line two baking sheets with parchment paper and spray lightly with the vegetable spray. Divide the dough into 4 portions on a lightly floured surface. Cut each portion into 3 smaller pieces, shaping each piece into a ball. Create a hole in the center of each ball and place on a baking sheet. 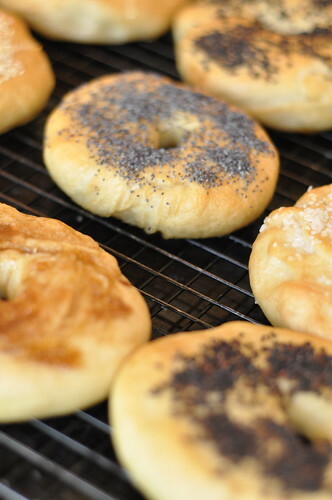 Spray the bagels with vegetable oil cooking spray and let rise for 20 minutes more. Bring a large pot of water (4-6 quarts) to a boil, and add the baking soda. Lower the heat so the water is only gently boiling; preheat the oven to 425 degrees. Place 3 bagels into the water. After 2 minutes, flip bagels over and allow to boil for 2 minutes more. Repeat with the other bagels. 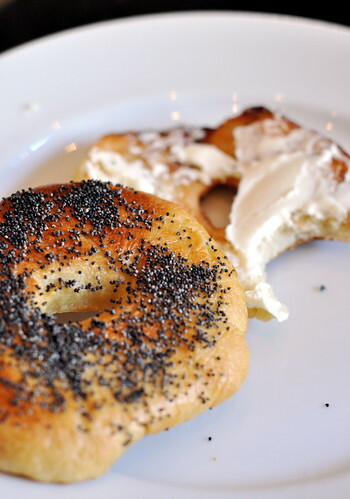 Set the bagels on the baking sheets lined with parchment paper and brush with the egg white mixture. Sprinkle each bagel with the desired toppings. Bake for 15 minutes, or until the bagels are a deep, honey color. 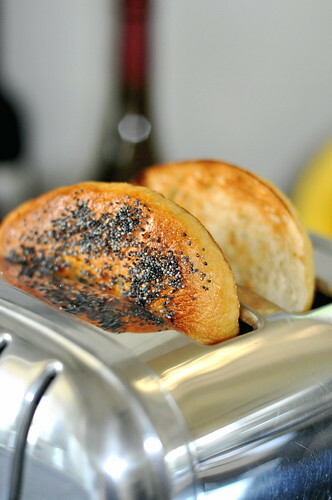 Toast bagels before serving and spread with butter, cream cheese, or jam.